- her birth date: 28 Aug 1833. - her date of death 10 Nov 1910 and she was buried in Overholt Cemetery, near Pt. Colbourne, Ontario, Canada. - she was married to Jesse Zavitz and had two children, Alonzo and Melissa. I did not have her parents. The once source I had for all of the above information was various entries of Ancestry World Trees. The first thing I found was her death notice in the Buffalo Courier, Nov 12, 1910. 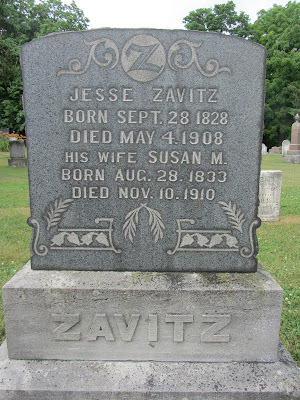 "ZAVITZ- In this city, November 10, 1910, Susan, widow of Alonzo Zavitz and mother of Alonzo Zavitz, Mrs. W. K. Minor, Mrs. W. W. Dell, Mrs Sloan Schooley of Gladstone, Manitoba, Mrs. Sarah Findley of Croland, Ont., and Mrs. Sellers of Detroit, Mich.; aged 77 years. The funeral services will be held at the residence of her daughter, Mrs. W. K. Minor, No. 205 Bird Avenue, Saturday evening at 8 o'clock. Friends and acquaintances are invited to attend. Interment at Overholt Cemtery, Ont., Saturday afternoon at 1 o'clock." I add Buffalo, New York to the death location in my Legacy database. I went ahead and checked, and was not surprised to find that I do not have the Buffalo Courier in my Master Source list in Legacy. I created a new Source, using the Source Writer, and not thrilled with it, as it doesn't really look the way I want. A quick check at Geni shows a profile exists for her already http://www.geni.com/people/Susan-Marie-Learn-Zavitz/4797133677360031033 with different two children Mary Jane and Nancy Theresa. Geni offered 4 hints to MH trees. As you can see, Geni tells me that Susan is my husband's second great aun'ts husband's second cousin twice removed's wife's mother! I think I can be excused for not having worked much on her before now since she is not exactly a close relative. I find it interesting that the path her is through a daughter not even in my database yet. Clearly there is lots to do! I enter all the above information into my Ancestry.com tree and get 7 Historical Record Hints and 1 Family Tree Hint. First Historical Record Hint is to the 1910 US Census. It shows Susan Zavitz, widowed, age 76, born in English Canada, both parents born in English Canada living with her son in law William K Minor and her daughter Ida Minor. I add the daughter Ida and her husband William Minor and add the birth location of Canada to her Ancestry profile. No additional hints appear. Second Historical Record Hint is in the 1881 Census of Canada. This record has Susan, age 47, with her husband Jesse, age 52, and children: N. Theressa, 24; Susan M., 18; Ida A, 17; Sarah L, 11. all living in Humberstone, Welland, Ontario. Third Historical Record Hint in the 1871 Census of Canada. Again living in Humberstone, Welland, Ontario is Jesse Zavitz, 42; Susannah M., 37; Alzonzo L, 18; N. Theresa, 14; Mary Jane, 12; Susan Marie, 9; Ida A, 7. Fourth Historical Record Hint is in Canada, Findagrave. This takes me to a photo of the gravestone for Jesse and Susan. I take a moment to request permission to use the photo here. Permission was very kindly granted. Fifth Historical Record Hint is in the 1901 Census of Canada. This one lists her full birth date of 28 Aug 1833, and she is age 67 living with husband Jesse, age 62 in Humberstone, Welland, Ontario. Sixth Historical Record Hint is in the 1891 Census of Canada. Jesse is age 62, Susan is 57, Ida is 27 and Sarah is 21. They are living in Humberstone, Welland, Ontario. Seventh, and final low hanging Ancestry fruit, Record Hint is the 1861 Census of Canada. She is age 28 living in Humberstone, Welland, Ontario. She is with husband Jesse and children Alonzo, 9; Melissa, 7; and Nancy. While I have added 8 sources, I still have much unverified. In particular I have no source on her maiden name being Learn. I also do not have her parents yet. I now have 7 children for her, 6 listed in the death notice. Mrs. W. K Minor was Ida. Mrs. W. W. Dell was Mary Jane. Mrs. Sloan Schooley was Nancy Theresa. Mrs. Sarah Findley was, of course, Sarah. Mrs Sellers was Susan M.
The birth of Sarah Louisa Zavitz lists her mother as Susannah M Learn as does her marriage record. There were 12 suggested Connections. I accepted 4 of them, the others had differences I would like to resolve first. One person indicated that her parents were Andrew Learn and Mary Elizabeth Macklem. For now that is what I am going with.